South Webster’s Kelton Kelley goes airborne. South Webster’s Shiloah Blevins drives to the rack. This time of year is one to remember for every high school team. Regardless of records or where a school is at, there’s always a night where seniors who contributed to the program are honored. Friday night at Minford, senior cheerleaders and basketball players were honored before the Falcons game against South Webster. In a night that was chalk full of moments to reflect upon, Minford was able to down the Jeeps in front of their home crowd by a score of 55-44. Seniors Breyden Tilley, Elijah Craft, and Logan Boston were honored before the game and were inserted into the starting lineup during the contest by Falcons head coach Josh Shoemaker. Each of three have played a vital part in the advancement of the Minford program, albeit in different roles. “It’s been great,” Boston said. “I’ve played with a lot of really good players to come out of Minford the past four years, and I’ve been really close with a lot of them, especially the seniors this year and the seniors who graduated this past year. Though the celebration was welcome, the seniors are focused in on what’s to come as their final season heads to tournament time. While it was senior night, there’s still plenty of basketball left to potentially be played. The Falcons aren’t ignoring that fact, and felt that their performance could be a sign of a tournament run at this rate. Minford didn’t play the whole four quarters as great as they might have hoped, and were struggling early. Despite being down four players due to illness, South Webster fought hard for the entire duration of the game. Playing without Samuel Holstein, Andrew Smith, Levi Murphy, and Josiah Edwards, the Jeeps faced plenty of adversity. “They knew going into it that we had a tough task at hand, being down three or four guys,” South Webster head coach Brenton Cole said. Still, Cole’s group looked good early. With Shiloah Blevins back in his second game from injury, the Jeeps had a big scoring threat back on the floor. Couple that with the emergence of players like sophomore Brayden Bockway and junior Jacob Ruth, and South Webster was left with plenty of weapons regardless of the lower numbers. Unfortunately for the Jeeps, the aforementioned group of players would score 38 of their 44 points as South Webster was able to find much scoring beyond them in the contest. After the first quarter, the Jeeps had jumped out to a 15-11 advantage. South Webster was able to create a four-point cushion with 2.3 seconds remaining in the period, as Ruth drove to the rim and made a basket while getting fouled. The Falcons got six points from junior Cameron Dalton, who would finish with 13 points overall. 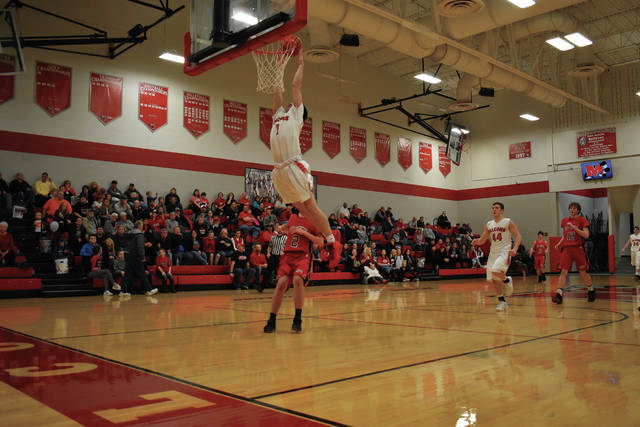 Going back and forth in the second, Minford was able to make a comeback with 9-1 run in the middle of the quarter with three different players contributing. Junior Kelton Kelley closed out the run with a steal and a three-point play for the Falcons to give them a 20-18 lead with 1:38 to play. Kelley had a game-high 21 points to lead the way for Minford. 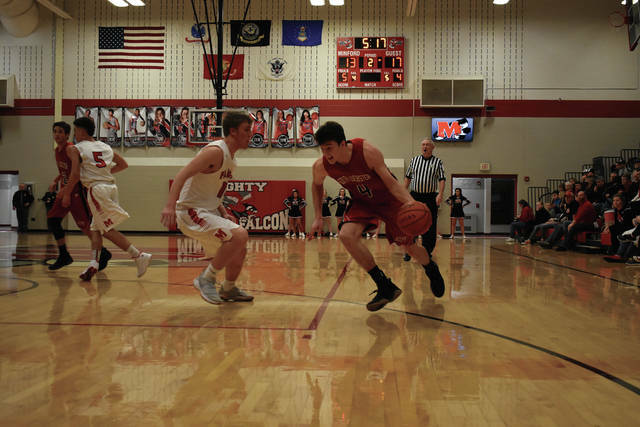 On the run, the Falcons mixed defenses and also implemented a rigorous full court press that was tough to cross half court on for the Jeeps. Changing the looks really seemed to benefit Kelley, as he had seven in the quarter. Although they only scored eight points in the quarter, South Webster led 23-22 at halftime. Minford was set to make some adjustments, though, as Shoemaker saw some areas his team could attack. Shoemaker wanted his players to play with more passion on the floor, and the press seemed liked a good idea. With the quickness of Craft, Tilley, and players like Darius Jordan, buying in to the press is easy. While the Falcons struggled in the first half, the press brought new life in the final two quarters to the defense and the offense. With a shorter bench due to players being out and the Jeeps still recovering from some injuries, South Webster was handcuffed by the press. Minford forced 11 second half turnovers, including six in the third quarter. Defense in the second half also struggled for the Jeeps, as they were limited at times to only defending the half court. South Webster got behind the eight ball a bit with the pressure, but a factor for them in the second half was Bockway. Bockway would score eight points in the second half, and 13 overall. After three quarters, the Falcons were ahead 39-33. Minford carried an 11-1 run into the fourth, ignited by threes from Kelley and Elijah Vogelsong-Lewis. Only a freshman, Vogelsong-Lewis has emerged as a key role player for the Falcons. In the final quarter, Minford pulled away with seven points from Breyden Tilley. Tilley hit a three-pointer just 14 seconds into the fourth, demonstrating a lot of confidence in himself. The Falcons outscored the Jeeps 16-11 in the fourth, holding on to win 55-44. Next up for both teams is their sectional tournament games, as Minford will take on Ironton and South Webster will play Federal Hocking. Ironton will face off against the Falcons at 8 pm on Monday night in Jackson. The Jeeps will play Federal Hocking at Meigs at 6:15 pm on Wednesday in their sectional challenge.